I think this is my favorite of the 4 from the weekend! I love this tree and the possibilities it has and really love the tire swing!! The In-Colors also go together GREAT for this fall look! 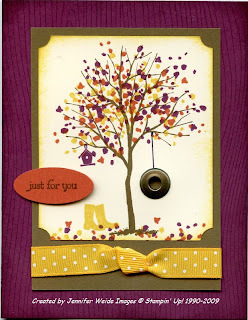 Card base is Rich Razzleberry with the Woodgrain background stamped on it and the edges sponged. Brown layer is Soft Suede, as is the tree. The leaves were stamped with the "dot" image by inking first with Crushed Curry and stamping 3 times around the tree. Clean the stamp and reink with Dusty Durango and rotate the stamp (so your dots are not in the same place) and stamp 3 times around. Repeat with Rich Razzleberry. Very pretty tree! Oh, and while you have each color, put a few leaves on the ground. Add the bird house in Rich Razzleberry, the boots in Crushed Curry and the tire swing in black. Use the crop-a-dile to punch and set a jumbo eyelet over the tire. Add a saying on the small oval attached with dimensionals, and a Crushed Curry ribbon, either dots up or down-your choice! The ribbon was just a bit wider than the Soft Suede, knotted in the middle and attached to the back of the Suede. The saying is from Teeny Tiny Wishes, and there are several in that set that work will with this size Oval punch. Whew! It's been a very nonproductive night for me and I have a big presentation looming this weekend. So, I may not be back til after the weekend. We shall see!! Wish me luck. The good news is that I will have LOTS of samples to share next week!!! And I get to spend the weekend stamping with stamping friends!!! I think that this was my favorite card too! I absolutely LOVE that tree!!!!!!!! !